The Croft is an oak framed farmhouse built on the site of an old bungalow in a rural location. 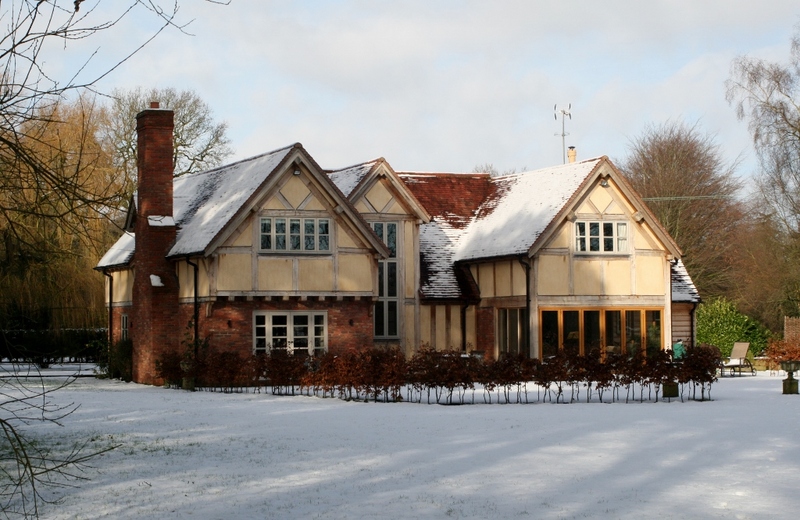 The house was designed by Border Oak and uses hand made bricks and handmade roof tiles to compliment the oak. Features include under floor heating throughout, MVHR, LED lighting and rainwater harvesting. The build took a year and was completed in 2010. Summer Place is a highly insulated timber framed home with a stone weatherboard fnish. The large three bedroomed home was developed to compliment the rural aspect of the setting which included river frontage. April Cottage was built on the site of two derelict attached cottages that had been vacant for 60 years in a village location bounded on three sides by occupied dwellings. The original stone was reused to maintain the barn like appearance from the road side and the rear elevation was extended to create an innovative U-shape to utilise available space effectively creating a large four bedroomed family home that maintained a high level of privacy. This project saw the renovation and reconfiguration of a Grade II listed period stone house while retaining many of its original features. The original 4 bed 1 bathroom layout was changed to provide 4 bedrooms, 2 bathrooms and a study area to suit 21st century family life. The house was extensively insulated, windows were upgraded and a glass link area was created to the rear which boosts natural solar gain during the winter months.